Update| as of September 1, 2017, The London Tea Bar closed their doors. I'm a huge fan of local, and when Shannon reached out to me a couple of months ago to come to her opening, I was really excited to connect with her (I'm a huge tea junkie) and then shortly after that, she invited me again to a Tea Tasting. The London Tea Bar has definitely, become one of my favourite stops when I'm shopping on Whyte Ave, located at 8116 Gateway Blvd. The Tea Bar has become a great spot for pop up shops as well, currently she is hosting a clothing designer in the back portion of the shop, she's hosted local artist's there as well, like Amy Dixon who paints the most gorgeous landscapes! But, I do highly recommend getting connected with what's happening at the Tea Bar through their social media links or check the websites for the latest events. A key feature and one of the things I love about the London Tea Bar, is that the owner, Shannon, brings in the freshest of teas, with no artificial colours, sweeteners or enhancers added. Of course, you can add a bit of honey or sugar to your likening but that's up to you. For our Tea tasting, we were able to go through and choose a wide variety of teas, Alora and I picked out ten or twelve teas to taste selecting a mix of five or six of the white, herbal and green teas, and then another five or six of the black teas for a total of about 12 teas. Shannon talked about the different flavours arranging our choices from the lightest taste (white teas) to the stronger more robust full-bodied teas. This way, the flavours wouldn't overtake our palates, sipping water in between to help cleanse our taste buds. The tea tasting was very much like a wine tasting.. but no spitting into a bucket required! During our tasting, we sipped and talked about the hints of lavender, or the sweet raspberry fruit teas, discussing which ones would be wonderful for a cozy night at home or which would be perfect for making a pitcher of iced teas (my favourite is the Ginger Snap.. P.S. Revolution Icecream makes some tea ice cream from this selection, it's heavenly!). By the way, you can set up at tasting for yourself, just email the shop for times and availability HERE. 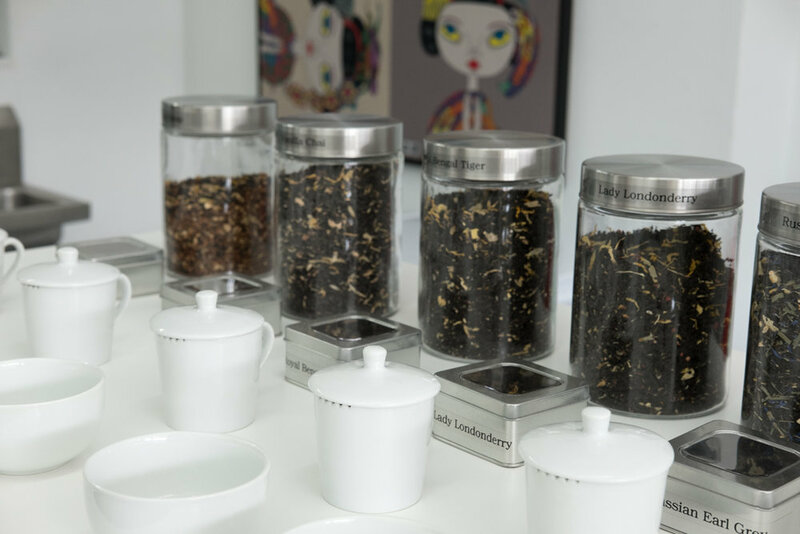 I've listed our favourite teas from our tasting, if you go let me know what you liked, if you have a favourite tea or was there one that your family really likes? Teas have become my new replacement for juices with little ones, especially the Strawberry Kiwi! !